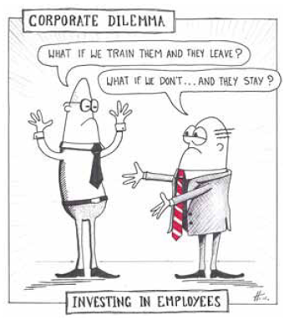 More than 40% of an employee’s educational training budget will not be used up, according to research from NIDAP (a Dutch research agency) Sometimes employees are expected to pay for their own personal development even after they were promise a yearly personal training allowance (i.e. when hiring a new employee). What if you want to continue your learning, but your supervisor / manager / HR department can’t approve the training courses because there is no budget? … and use it as a reason! Understand the goal of your organisation and clearly demonstrate that this course or training module will help you in your stance on reaching the company’s objective. 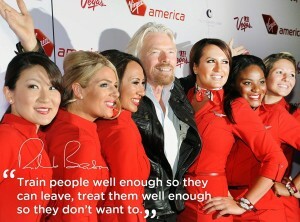 “Train people well enough so they can leave, treat them well enough so that they don’t want to.” As Richard Branson says, if managers look after their staff, they’ll look after them and the company’s customers. Not rocket science. Express that developing you will increase your motivation and help the organisation as a whole. High motivational levels mean that you and your colleagues will all become more productive… which manager doesn’t want that? Perhaps a strange source of inspiration, but look again to check out which skills can be exercised to help you keep your current job (or perhaps a future position). You may be saving your superior the effort to approve the push for your allocated budget. For starters, eLearning is often cheaper. With eLearning courses, there is no teacher or trainer breathing down your neck. Also, you can do the course from work, speeding up your learning process. At Springest, many employees also follow online courses; they reserve 2 hours per week at fixed times in their agendas to complete the course. After the agenda item is set, colleagues will be able to see the availability of their studying team-mates in order to schedule meetings and other work items. Express that your development is useful for possible change within the organisation: it increases your flexibility. If you are specialised in more areas, it costs less to give you another role or position in the company if there is reorganisation. In such an instance, your employer would be saving money by giving you an educational budget. Look at it as an investment! Find out which options your organisation already offers: there are often general rules to follow courses. Make sure that you know what criteria your course of interest must meet according to company standards; in most cases there is even a collective agreement. If you are still unsure, you can always ask the worker’s union what your possibilities are. Otherwise, there may be an HR professional in your organisation that can point you in the right direction. There is nothing better than being fully prepared before going to an impromptu appointment about allocated company budgets. With that being said, make sure you have a strong position and know the rules and regulations! Determine in advance how much of your own time you are willing to invest in education so that you can come up with your own private investments if necessary. This will let your employer see how motivated you are to develop yourself and that you are willing to focus on self-investment. After demonstrating your motivation, you will have a leg to stand on when you speak with your employer about the company’s investment.